Thanks to Gabrielle and Joan for the photos! 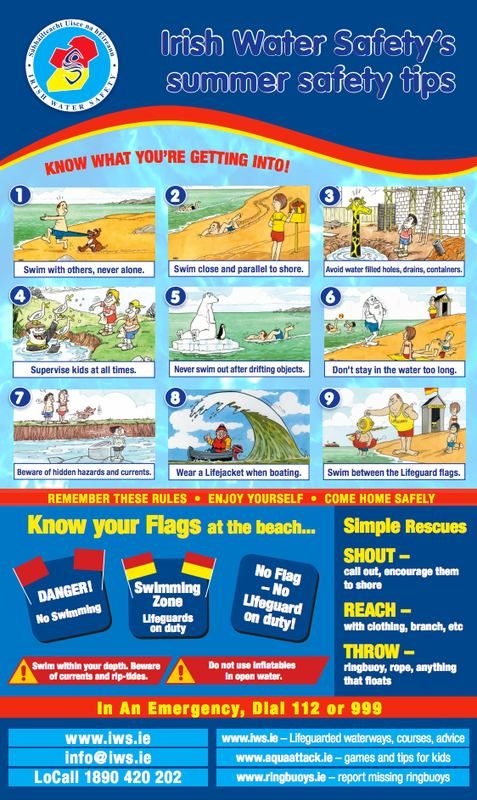 Enniscrone Water Safety Week begins the FIRST Sunday in AUGUST. The enrolment is on the Saturday 2nd at 8pm at the pier, you can get details on the website or Irish Water Safety Sligo Facebook page. The cost is €45 for 1 child, €60 for 2 children and €80 for 3 or more children from 1 family. If paying by cheque, make payable to: Sligo Area Water Safety Committee, please. Each class get 2 half hour sessions a day, and safety and rescue levels have a third half hour session for land drills. Due to tides, we post the timetable daily on pier and on Facebook. You will get the Sunday times the evening of registration. Swim exams are on the Thursday morning usually with IWS certificate awards in the afternoon at the pier. Safety and Rescue Exams are on the Friday, we have IWS examiners for these awards and they control the Friday exam timetable, these IWS certificates are presented the following year. If a Self-Address-Envelope is left with the organisers, when certificates are issued from IWS Headquarters Galway we will post them on. Children are not required to be able to swim, these courses allows children to get used to the sea, learn the dangers and learn how to swim. As you may know swimming in open water is totally different than the pool, with this in mind we find that a pool level should be moved down one or two levels for open water. It really depends on each child’s ability and confidence. Children are taught personal safety around water in all levels. SPLASH is very basic from 4 years, playing ring-a-ring a roses etc. putting face into water, moving around with a float etc. Swim 1, begins push and glide with a float, regaining feet and putting face in water etc. Swim 3, 10 mtrs front crawl, 10 mtrs back stroke, 5 mtrs inverted breast stroke, skulling etc. Swim 4, 15 mtrs front crawl, 15 mtrs back stroke, 10 mtrs breast stroke, 10 mtrs rescue stroke, treading water etc. Swim 5, 25 mtrs front crawl, 25 mtrs back stroke, 25 mtrs breast stroke, 10 mtrs inverted breast stroke, 10 mtrs side stroke, straddle jump, safe entry shallow dive. We teach Safety levels 1-4 and only when Safety 4 has been awarded can you move onto Rescue levels. There is no age prerequisite for Safety levels. Age prerequisite for Rescue 1 is 12 years, rescue 2 is 13 years, rescue 3 is 14 years and rescue 4 is 15 years. If a child can swim, but doesn’t know a particular stroke, they will be taught it. We believe a child should be put into a lower swim/safety group and the instructor will move a capable swimmer up a level (building confidence) rather than a child being moved down levels…. Children are not required to wear wet-suits, but as a growing trend all kids seem to have them now! Kids really enjoy this week and the memory and skills they learn will be with them for life! Timetable for Sunday August 3rd! Update : We need all fundraising cards back by Wednesday August 6th 6pm at the latest please. Please bring them to the clubhouse before the Nippers training session at Rosses Point beach. 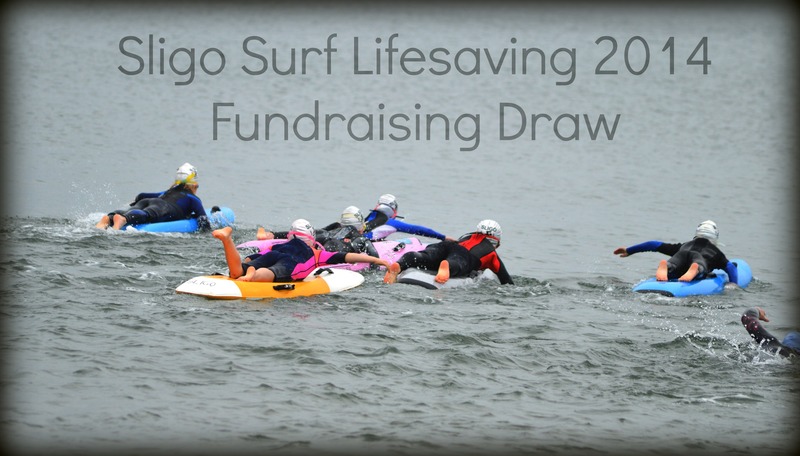 Sligo Water Safety officially launched its fundraising draw for Surf Lifesaving this week. All funds will go towards the purchase of a trailer for carrying the clubs paddle boards and ski’s. Prizes up for grabs include a number of hampers, Oakley sunglasses worth €150, 2 x €50 vouchers for Call of the Wild and voucher for Voya Seaweed baths, Sligo Cryo Spa, Dorothy Perkins and Shells Cafe. We would like to thank all those members who contributed items to the hampers and the businesses who generously offered prizes, including McPartlan Opticians, Call of the Wild, Dorothy Perkins, Sligo Cryo Spa and VOYA. To enter, get in contact with one of the members who have fundraising cards. Each line is €2, 3 lines for €5 or a full card of 20 lines for €30. Contact us via our facebook page or our email if you would like to sell a card. The Draw will take place on the 9th August.